RP42915SS is rated 1.9 out of 5 by 17. This Leland 6-1/2 in. Non-Metallic Pull-Up Diverter Tub Spout in Chrome gracefully reinterprets the time-honored teapot design with decorative, traditional detailing. Getting ready in the morning is far from routine when you are surrounded by a bath that reflects your personal style. 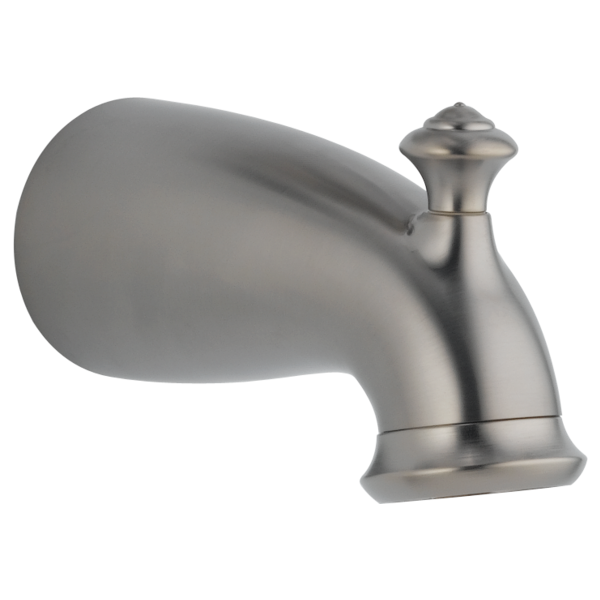 Our faucets and their parts are guaranteed for a lifetime, but just in case you'd like to make some repairs on your own we've made this tub spout available for you to order. Rated 2 out of 5 by Cheesehoops from Tub diverted failed in a few years Looks nice but cheaply made. Had approx 3 years and water is coming out of the top when the diverted is engaged. I hoped to get much longer use out of this set. Rated 1 out of 5 by bummedout from Only lasted 3 years We installed a new tub and shower faucet and spout 3 years ago. The diverter on the spout is stuck and wont work and the chrome finish is peeling. Very disappointed in this product. Rated 2 out of 5 by DickH from Not cheap to buy but not well made. Outside is metal, inside is plastic. Spout broke off and sprayed water all over when diverter knob was pulled. Rated 1 out of 5 by LizG from Horrible quality I purchased two of these faucets as part of a home remodel less than three years ago, and already both of them have failed. The entire unit is made of plastic -- it is chrome colored, NOT actual chrome -- and the interior plastic has broken off on both of my original faucets already! I replaced the first one a year ago, and the second one simply fell off this morning during a shower. These have not been used in any unusual ways. They are simply terribly made! Rated 4 out of 5 by FrankM3 from Leaking internal RP42915 diverter Have an RP42915 Chrome diverter in one bath room leaking and was wondering if the internal plastic parts that hooks onto the water outlet pipe are available separately. The plastic parts have cracked and are allowing water to leak out the chrome spout cover square drain hole! Looks like several plastic parts and Orings are needed. From reading other reviews I understand the assembly as a whole comes with the plastic parts. Again I was just wondering if the complete set of plastic parts and Orings are available separately? Thank you! Rated 1 out of 5 by Charlie2016 from Diverter breaks upon using We remodeled our bathroom 3 years ago and had Model RP42915SS Delta Tub Spout installed in our tub. One year later the diverter was not closing properly and not giving us use of our shower. I ordered a replacement in January of 2016. I received a broken diverter as a replacement. I called and was shipped out another on March 4, 2016. I opened box and take out of package and diverter assembly came apart. Haven't been able to install 2 replacements. I am being sent another today June 24,2016. NOT HAPPY. if 3rd spout doesn't work I will ask for refund and never recommend DELTA products..Please fix this issue. Love the look but hate the performance. Seems other RP42915SS customer reviews share my issue. Rated 2 out of 5 by WyoDon from Diverter faulty During a 2013 bathroom remodel, I had the T17478 tub/shower assembly professionally installed in the tub. The dual function flow control-temp control valve has worked flawlessly but recently the pull up diverter spout started leaking water when in the pulled up position. It leaks so badly that the water flow control has to be turned on all the way to keep the diverter in the shower position. This wastes water, not to mention the energy to heat the water. Rated 3 out of 5 by Bendon from Same story, different verse. I remodeled my master bath in February 2011. The diverter on the spout lasted 3 1/2 years before it broke. The replacement diverter just broke. I will be ordering my 3rd spout in 5 years! Delta- what's going on? Cheap internal plastic parts, I suspect. I purchased shower package T17478-rb. The tub spout is plastic. The part no is x00061469rb Did I get the correct piece? I have a Leland stainless bathtub unit only in another bathroom and the spout is metal. I purchased another Delta Leland product because I was happy with my first purchase. This plastic spout seems very cheap for a Delta product. Thank you for your question. Delta Faucet model # T17478-RB does contain a non-metallic tub spout. We do not have the metal tub spout available separately but we do have other metal tub spouts available. I&rsquo;ve removed spout RP5834 and want to replace it with this spout. The brass adapter cannot be removed. Does this spout have the white plastic insert and if so, will it twist on over what appears to be the RP12307 adapter that is not able to be removed? Need to know if this part includes the plastic adaptor? Replacing existing spout. It has white plastic adaptor inside that is broken. Wall side of adaptor needs to fit outside of copper pipe with threads at 1+1/4&quot;. The spout end of adapter should fit into 1/2&quot; threads (by pull up diverter).